Every once in a while I run across something that is so hard to believe I have to blink and read it again. That's what happened when I read this article on craft beer retail sales laws in Colorado. It can only be sold in liquor stores. Ye gods. We're talking about Colorado here. A state that has been one of the beacons in the craft beer revolution. A state that is home to the Brewers Association and the Great American Beer Festival. A state whose per capita brewery count is higher than Oregon. A yet state where you can't find craft beer in your local grocery store. As you will discover if you read the linked article, the only beer you can buy in Colorado grocery and convenience stores is low alcohol sludge (4% ABV or less). Many bills have evidently tried to change the law in the past, and all of them have been slapped down...blocked by the craft industry in Colorado, which fears it would hurt business. Seriously? Enter Kevin Priola, a Republican state representative from Henderson. Priola is preparing to introduce a bill that would bring most craft beer into grocery and convenience stores. There are some limitations on the size of the brewery (less than six million barrels/year) and ABV (under 10%). These limitations seem designed to keep fake craft beers (from Coors and AB) out of stores while putting a lid on the how much alcohol beers in stores can have. Priola says his bill is a "Goldilocks model....something for everyone and not too hot or too cold." He figures the grocery stores will support the bill, even though they'd like to be able to sell a full line of beers. He's a little sketchy on whether liquor stores and the Colorado Brewers Guild will support it, but he hopes the Goldilocks approach will win them over. Film at 11. From my outpost in Oregon, it's a little hard to understand why anyone would think selling good beer in grocery and convenience stores might hurt business. Do the brewers own these supposedly independent liquor stores? Reasoning like this suggests we were better off when craft beer occupied only a few feet of shelf space and macros had all the rest. Dark days. 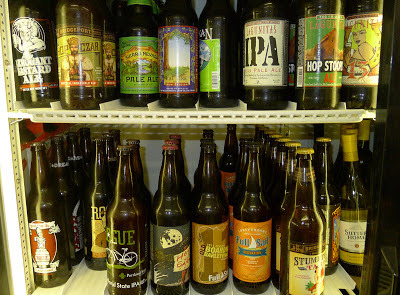 Go into any decent Oregon grocery or convenience store today and you're apt to find a generous selection of craft beer. This didn't happen overnight...it took years. And there's no doubt that what we've done here has been rather good for business. You might say it's helped launch a wave of breweries and pubs that distribute in bottles or cans. Making good beer easy to buy in grocery stores has been a good thing. It hasn't hurt business. I've heard from several people here in Oregon who also have no apparent understanding of Colorado's strange laws. These are people in the business and they say your laws are a joke. That's a quote. I'd like to understand how keeping craft beer out of grocery stores helps smaller brewers. We seem to be doing just fine here in Oregon, where craft beer is sold everywhere. So perhaps someone can enlighten me (us) on the finer points of Colorado alcohol laws and what this particular bill would have done. Until I get an explanation that makes sense, I'll stick with my thoughts above.